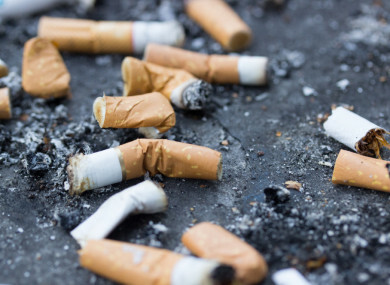 A litter report showed that cigarettes make up half of street litter. THE GOVERNMENT IS considering ways to decrease litter on the streets after a report indicated that cigarettes make up half of all street litter. TheJournal.ie understands the Minister for Communications Denis Naughten intends to increase the on-the-spot litter fine from €150 to €250. On-the-spot fines can be issued by a litter warden appointed by the local authority or by a Garda. The 2017 National Litter Pollution Report showed that the main constituent elements of litter pollution nationwide were cigarette-related litter (56.3%), packaging litter (17.6%), food-related litter (9.0%), and sweet-related litter (7.9%). The report also shows that pedestrians are the main causes of litter (42%) and passing motorists are the second greatest offenders, accounting for 19% in 2017. Commenting on the findings of the report, Minister Naughten said that while some of the results are “encouraging”, more work needs to be done. Email “Government to increase on-the-spot litter fines to €250”. Feedback on “Government to increase on-the-spot litter fines to €250”.